Potjie | HaftaCraft - Sometimes, you just Hafta Craft! I did this because i felt bad for what dropnest did. I am not the type of person that is a cheap player. 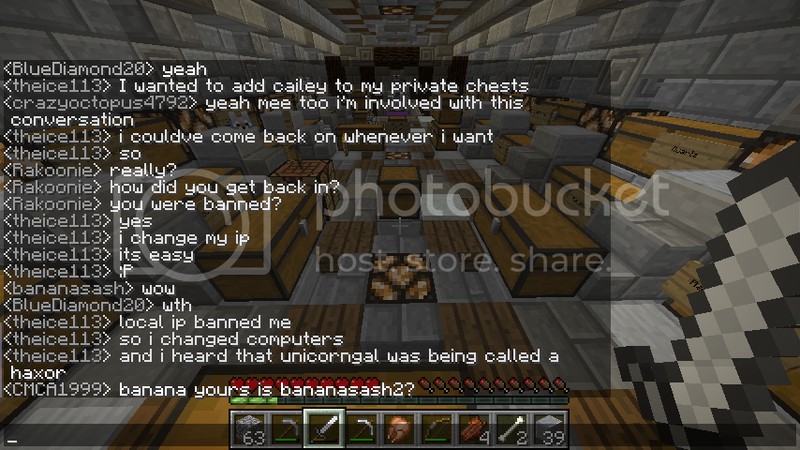 I DO NOT like the feeling of being banned or greifed or even raided so i don't do it myself. I hope you understand how frustrated I am at Dropnest for lying that i broke and placed all of the blocks that He actually broke and i hope you get this situation straight. and he broke everything he placed leaving no trace of how he got in. He had locked me in the house so after he left i had put all of the extra crops and food from the animals i found in a chest that the owner had previously put down to store items in. Then i had wrote an apology on some signs saying i had salvaged some things he broke. Dropnest took all of the owners nether wart so i replace some. Once he broke into the house he started raiding the house and breaking crops. When he found the farm he broke into the farm. (broke the fence) After breaking into the farm he killed all of the animals. I was telling BueDiamond everything that was happening in the private messaging as a witness. Then when he left the base he put down a sign saying "Raided by Dropnest"
So i finally got his trust and was trying to negotiate with him. At that time we were outside of someones house. Then he put down a crafting table and broke in by putting down a pressure plate. As all of this was happening I told him that was greifing. These words came out of HIS computer " I dont care". Then he did the same to another door inside of the house . I would like to know why I got banned.. I did not help or break blocks in any way. I was only went into bananasash's house to make sure dropnest did not break or hurt anything of my fellow players things. When BlueDiamond, MisterPurp, Dropnest and I were on we were trying to make a plan to get revenge on drop for taking MisterPurp's belongings. You realize that she only went into banana's base was to make sure DropNest didn't completely wreck the place? He was using pressure plates to get into bases and then raiding them. Cailey was there as a witness pretending to be an ally of sorts so she could catch him in the act. She did not place any of the pressure plates. Cailey3000 "deserves it" because she was trying to make sure that the server would still have some peace (although that's pretty far fetched for some of us now). She was helping not hurting. You can ask banana. She didn't take anything from the base. Once she realized that the base was surprisingly ok she went out the way she came. Can I break blocks in berries bace if he is inactive? hi someone destroyed two slabs, two doubles chests, and the spawner we had used for grinding. also there used to be a stone slab but now there is a diorite block. also someone raided me and left signs. I'm not salty about the raid bc all we had was junk and building blocks in it but i just want to know who did it. oh ok thanks. yes i accidentally put the wrong coords sorry about that. If I accept a request in my house and they raid me because of it like they just stayed there and took my stuff, will they gat banned? Ok thanks. He will be happy. What did he break? Is epearl glitching allowed? To raid a bace with. Can I break the one block gap to your cane farm w/o getting banned? I just need herbalism plz?